Influencing one person is difficult. But influencing the five-plus decision-makers responsible for a major business-to-business purchase decision can feel like an impossibility. 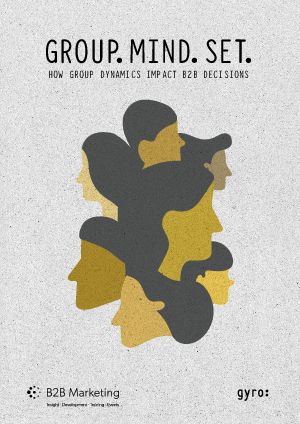 B2B Marketing, in conjunction with leading full-service global B2B agency gyro, set out to find the truths about today’s group dynamics. We asked decision-makers to discuss the impact of the precision of rapidly advancing marketing technologies. At the same time, we explored the role that feelings play during these high-risk, high-cost, career-defining moments. The responses portray a clear picture. Before the group gathers, most have a preference as to whom they would like to select. They have spent a significant amount of time and energy reviewing the potential partner’s content, communications and culture. Once the group is assembled, the ultimate decision is often driven by a senior executive who serves as the brand champion for the winning vendor. This key player, as well as those who influence his or her thinking, is the ultimate target of the B2B marketer. This report explores the many drivers that marketers must embrace to impact the group as a whole as well as the all-important brand champion. It also delves into the mistakes marketers must absolutely avoid in order to bring a group to a positive consensus. The findings are supported by interviews from top marketers and supplemented by contributions from gyro.